Ban Loma. L2, Coconut Laguna, 8/3 Moo 5 Ban Tai. Koh Samui. Thailand. 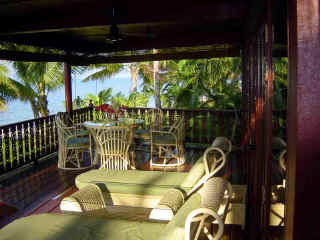 Ban Loma has four bedrooms and three bathrooms and can accommodate families or groups of friends. It is also a unique hedonistic sanctuary for the honeymoon couple and is particularly popular with couples seeking a private luxury hideaway. The interior décor was completed by top Anglo-Asian designer Suzy Nina. The exquisite master bedroom suite with a Royal style canopied king size bed, luxuriant soft silk furnishings unveil the spectacular sea views from every window. The master suite has its own dressing room, en- suite bathroom and a huge wrap-around balcony encircled with bougainvillea. "Well worth flying halfway across the world for"
The sitting room and dining area can accommodate eight people in comfort. Meals can be taken there or more informally on the verandah, cooled by gentle breezes, where you can laze on the sun loungers and enjoy a cooling drink. 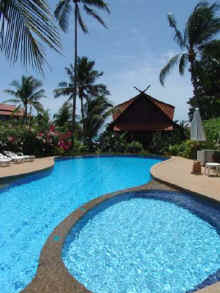 The huge swimming pool in the garden to the rear of "Ban Loma" is beautifully landscaped. The manicured lawns and gardens to the villa are stocked with bougainvillea, hibiscus, gardenia, frangipani and other exotic tropical plants. The downstairs bathroom leads directly outside to a private open-air Thai Spa area with its own Jacuzzi/whirlpool bath, feature waterfall and massage area where you can relax and book a Thai massage or beauty treatment in the peaceful sanctuary of your own villa. The three additional bedrooms all have fitted mirrored wardrobes two have queen-size 5' beds and the third twin divans. 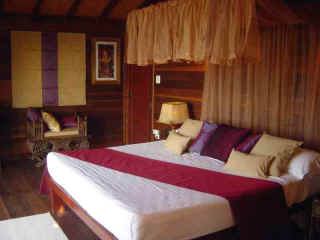 Each room is decorated in an individual Oriental/Thai style. Several restaurants and beach café/bars are within a short stroll of the villa along the beach. Sophisticated dining is available nearby in luxury hotels and restaurants all within a short drive. The beauty of the villa is that you can eat in or out - perhaps cook your own BBQ on the beach or have a takeaway meal delivered. Simply please yourself - but for the ultimate luxury experience, have your own Cook who can shop for, prepare and cook a meal for two or more for a small daily supplement. 36" colour TV with surround cinema sound. Well equipped Inside Kitchen including Fridge/Freezer, Microwave, with an abundance of crockery, cutlery and utensils. Outside Kitchen with electric hobs small electric oven/grill & gas hob to cook Thai style. Master Bedroom has luxurious designer furnishings & canopied king size bed with ensuite dressing room & private bathroom with dual basins, bidet, shower and w.c. Large bougainvillaea encircled private balcony leading off the master bedroom Cable TV & CD/DVD player in master bedroom. 3 further bedrooms all with individual Oriental/Thai décor. 2 further bathrooms with dual basins, shower, bidet and w.c. Downstairs bathroom leads to open-air Thai Spa area with its own Jacuzzi/whirlpool bath, waterfall and massage area. Inside dining area table seats eight. Outside verandah dining table seats six. Air conditioning in all major areas & every bedroom. Telephone with free local calls and internet access. Optional extras arranged:-Daily (8 hours) Cook/Maid available from THB 800 per day. Car Hire from THB 700 per day. Massage in your villa's own spa from THB 300. Free use of nearby well equipped gym. Flowers, fruit & cooling welcome pack on arrival. Ban Loma Dolphin Beach House. 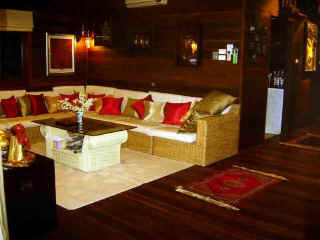 Beachfront Villa for Holiday or Vacation or Honeymoon. Tropical Island House on Koh Samui in Thailand.